Need more apps for your favorite device? iOSnoops can help! Here are 28 iPhone and iPad apps that have just gone free. 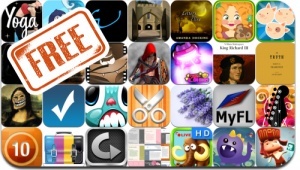 This apps gone free alert includes LostWinds, Swingworm, The Fleas, South Surfers, Infinite Warrior, Monster Chorus, A Pew Pew Land II, Print Apply, Scrap It: Halloween, GPlayer, and many others.